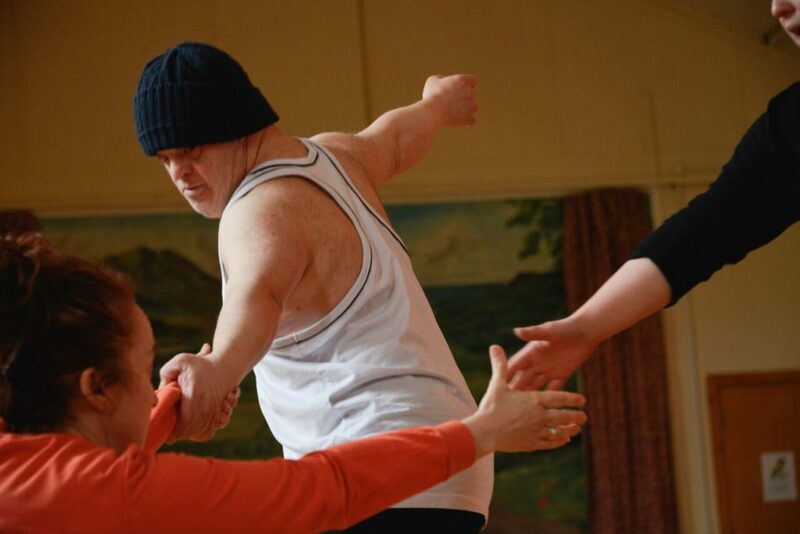 During their residency here SiD (Shropshire inclusive Dance) spent their time engaged in a number of activities. Both taking the opportunity to re evaluate their teaching practices (they team-taught their workshops here), time to dance together, to walk in the locality and experience the qualities of the place, allowing this to feed their ideas and practices. The company (consisting of co directors Ray Jacobs and Rachel Liggit and learning disabled dancers Mervyn Bradley and Chloe Shepherd) co-taught three workshops; in Abercych with 20 participants and carers from Clynfyw Care Farm; with 30 participants from Pembrokeshire People First, Haverfordwest and an inclusive family workshop(30 people) in Abercych Village Hall. On the final weekend the award winning films ‘Four solos in the Wild’ made nearby in Tycanol woodland in 2016 and featuring the company dancers, were screened in the rooms of 2 Penrhiw, and were visited by over 75 people from the village and surrounding region. Following the residency, we screened the films at Clynfyw Care Farm in early May to 15 participants who were unable to attend the original film screenings because of transport issues. ‘Just wanted to let you know that Friday’s dance work shop was a roaring success, so pleased we went! Everyone enjoyed it, we took quite a big group in the end, and all had a really good time. The hosts were obviously very experienced with presenting and guiding the process, and they took great care of us.